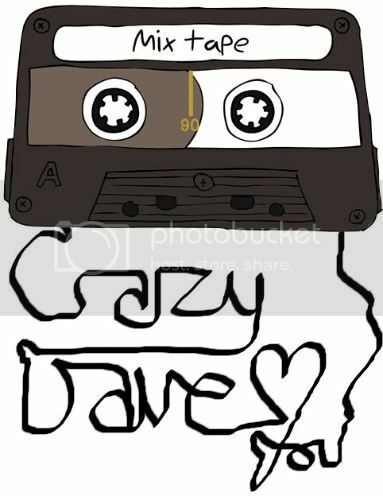 It's a special post today as Crazy Dave has made a rather lovely mixtape for us all to enjoy, imagine you've been trying to catch his eye in the school corridor for ages but you don't think he's noticed you when one day he appears at your locker and casually hands you this saying 'it's the kind of stuff i play, it's mostly new, from the last year or so' then he saunters off and you're left weak at the knees but it doesn't matter because he's already gone, without even so much as a glance back. Does he like you? Doesn't he? Why not? As you listen intently to the 53 minutes of his lovingly crafted handiwork you realise that it's been made the old fashioned way, every track played through in it's entirety and overlapped perfectly with the next, the levels precisely adjusted and the intros cut and cued to his desire. A wise man once said 'a mix CD is lust, a mixtape is love', you can make up your own mind. If you can't imagine that then i suggest you venture down to D.I.S.C or Captcha where you can experience it for yourself. I thought he loved you but he wasn't *in* love with you?